The Tile Shop, a specialty retailer of natural stone and man-made tiles, has announced its partnership with Laura Ashley, the British lifestyle company and one of the world’s leading brands, to become the exclusive retailer for the Laura Ashley tile and splashback collection in the U.S. market. Bringing modern English design to the kitchen, bathroom, mudroom, and more, the Laura Ashley line at The Tile Shop is the newest addition to the ever-expanding Laura Ashley fashion and home furnishings collections. The oversized, tempered glass splashbacks, a very British term, are expertly designed to fit the space between stovetops and cabinetry in the kitchen as well as behind the sink. The splashbacks feature statement prints taken directly from the Laura Ashley archives in a variety of colors, which can be styled as a design centerpiece or made to blend with existing décor. 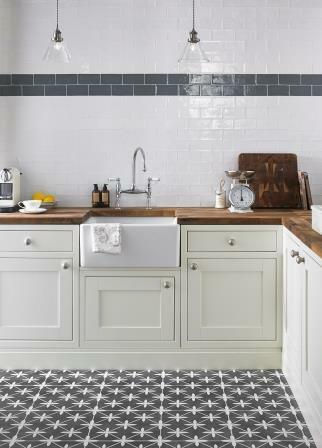 Complementary ceramic floor and wall tiles in graphic Laura Ashley heritage prints offer a multitude of designs that bring the entire look togetherwith ease. 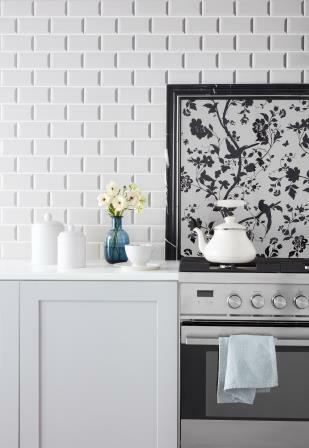 Imported from Great Britain and manufactured by UK tile specialist British Ceramic Tile, the Laura Ashley tiles and splashbacks are now available for order at any of The Tile Shop’s 140 stores and online at tileshop.com. “We are thrilled to partner with Laura Ashley to offer this exclusive new collection, which introduces familiar floral patterns and muted tones synonymous with the Laura Ashley brand to customers who are seeking simplicity and elegance,” said Kevin McDaniel, vice president of merchandising, The Tile Shop. Statement Prints – the collection of timeless patterns takes inspiration from the Laura Ashley Archive and Home Collection, ideal for creating an elegant look that commands attention. Available in: Lisette, Mr Jones, Oriental Garden and Wicker. Floor and Wall Tiles: From natural textures to striking prints, the Laura Ashley tile line offers a multitude of designs that bring the whole room together. The floor tile selection has been chosen to complement the splashback collection. Available styles include Wicker and Mr Jones.